Amy Grogan shows her work in her Mancos studio. A landscape print featured in Amy Grogan’s new show, which will open Saturday at Olio in Mancos. Amy Grogan holds one of her carved linoleum blocks, left, next to the final printed product. 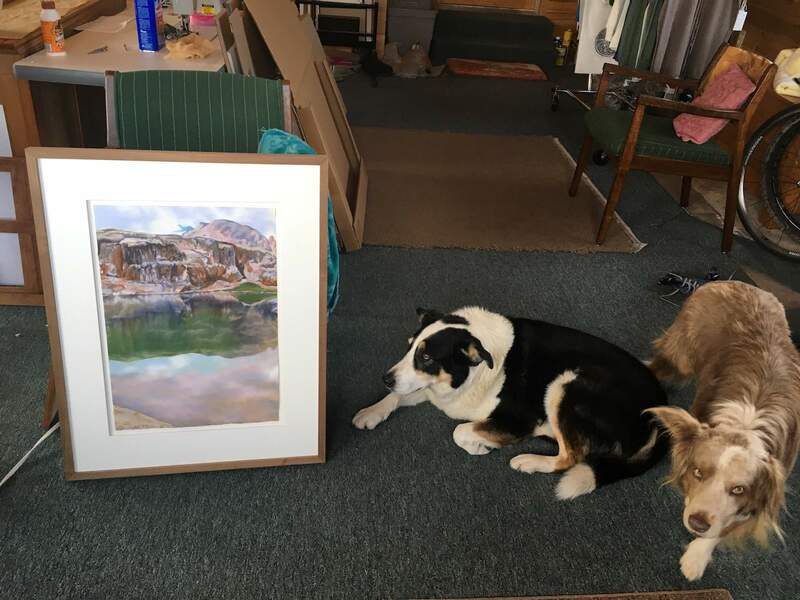 Amy Grogan’s dogs, Jolly and Aura, hang out beside one of her pastel paintings in her Mancos studio. A Mancos print and pastel artist will bring her vision of the West to the Olio restaurant and gallery on Saturday. Amy Grogan has been a printmaker for about 30 years, and she also works in pastel paintings. Most of her work, created in a spacious country studio outside Mancos, depicts animals and landscapes of the West. Her work has been featured in galleries in the Four Corners and internationally, but this will be her first display at Olio. Grogan creates most of her work by carving images into blocks of linoleum and covering them in ink so they make impressions when pressed onto a canvas. Some of her prints look like simple drawings of animals against a monochromatic backdrop, but others present multicolored, multilayered images of deserts, mountains and forests. 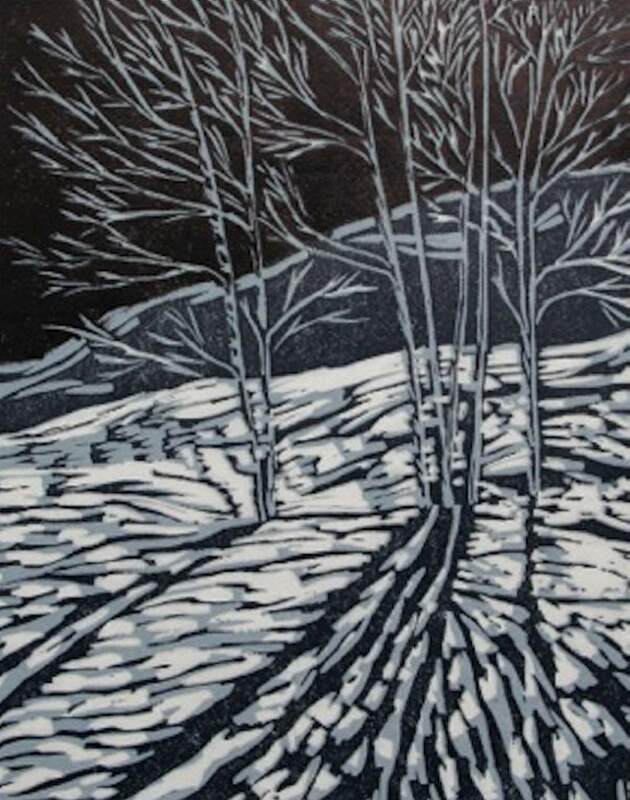 Grogan uses a technique called reductive printing to create her more complex pieces, carving layers of detail into the same block and printing it with different colors until it forms a complete scene. 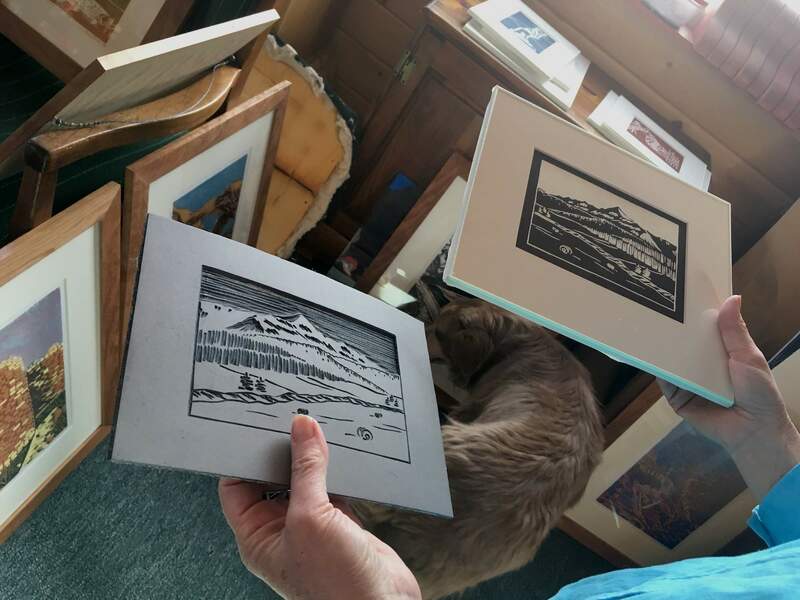 The Olio show will feature a series of small prints depicting animals native to the San Juan Mountains, as well as printed desert and forest scenes and a few pastel landscape paintings. Although she enjoys painting, Grogan said she decided years ago to come back to printmaking as her primary art form. Prints and paintings require a high level of drawing skill, Grogan said, which she’s cultivated throughout her career. Whether she’s painting or printing, though, she said her favorite part of the process is playing with the colors and patterns found in trees, rocks, feathers and fur. She said she’s inspired by a love for the outdoors. Because of that love, she said, she decided to move west from her Wisconsin hometown about 26 years ago after spending some time as a volunteer in Canyonlands National Park. “I just was never going to go back to the Midwest after that,” she said. 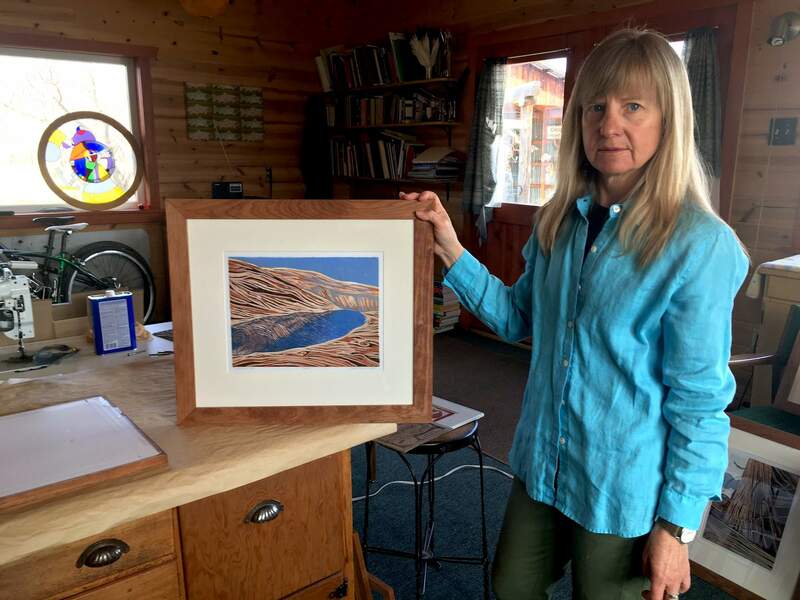 Grogan’s art has appeared in galleries in Chicago, where she received her fine arts degree, and in Durango, Telluride, Santa Fe, Cortez and Silverton, where she owns her own gallery. In 2010, she had a solo show in France, and in 2014, she was the artist in residence at Canyons of the Ancients National Monument. But although she lives and operates her business, Wize Owl Handprints, in Mancos, Grogan said she hasn’t held many shows there in the past. She said the paintings in the Olio show will have a wide range of prices to make them more accessible to a wider range of local art lovers. Grogan’s artist reception will start at 4 p.m. Saturday. Her work will be displayed at Olio through June 2.